Imran Haider leads the Wells Fargo Gateway, a market-leading open API channel that was established in 2016 to connect Wells Fargo to its partners and customers. The Gateway is one of the first and largest bank-based API channels globally, with use cases across payments, account aggregation, identity management, fraud mitigation, and data services. 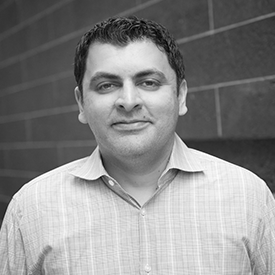 A 15-year veteran of Wells Fargo, Imran has previously held leadership roles in strategy, product management, and business development. Prior to joining the Gateway team in Digital Solutions for Business, Imran was head of retail digital payments and mobile banking. In this role, he led a team that managed eight consumer and small business brands with more than $650 billion in money movement per year. His major accomplishments include launching Zelle, Wells Fargo’s P2P payment service; establishing the open API channel; and leading Wells Fargo to a #1 ranking for both the retail digital payments portfolio and the mobile banking app (Forrester Research and Money Magazine). Imran earned his bachelor’s degree in electrical engineering from Johns Hopkins University and his master’s degree in applied mathematics from Columbia University. He is based in San Francisco.